BUTLINCAT's BLOG: bent cops, gangs, addiction: "Drug Wars: The Terrifying Inside Story of Britain’s Drug Trade" + more bent cops: "A Great British Injustice: The Maguire Story"
bent cops, gangs, addiction: "Drug Wars: The Terrifying Inside Story of Britain’s Drug Trade" + more bent cops: "A Great British Injustice: The Maguire Story"
"A Great British Injustice: The Maguire Story"
Random House presents the audiobook edition of Drug Wars by Neil Woods and J S Rafaeli, read by Neil Woods. To know the true story behind a war, ask the people who fought it. 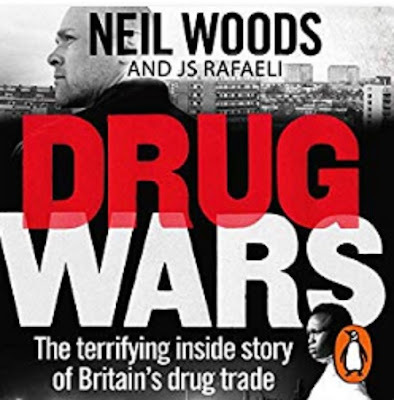 From the bestselling author of Good Cop Bad War, Neil Woods, comes the first inside history of Britain’s War on Drugs told by those who were there. Calling upon the gripping first-hand accounts from those on both sides of the battle – the cops and the gangsters – as well as Neil Wood’s experiences as an undercover drugs detective, Drug Wars will build a complex, authentic and terrifying picture of the reality of the drug war in Britain. Beginning with the Misuse of Drugs Act in 1971, we watch decades of violence, racial tension, organised crime and a monumental increase in addiction unfold. We see the birth of rave music and dance culture, and yet even more tabloid hysteria. And throughout, we look at the huge numbers of civilians that have fallen victim to Britain’s war on drugs. Get the Audible audiobook for the reduced price of £2.99 after you buy the Kindle book. Regardless whether you are fully immersed or simply an observer of our drug fuelled culture here in Great Britain, you are affected by the war on drugs. This book takes you on a journey into the reasons why we are fighting in such an uncompromising, relentless and futile battle. The empirical and observational evidence that this book cleverly offers is surely enough for us to attempt to change such absurd draconian measures. I was already against prohibition prior to reading this book; this sentiment reinforced by reading Neil Woods' first book, 'Good Cop, Bad War', 'Drug Wars' has given me a deeper understanding of the origins of the war against drugs, how it changes and adapts and a further incentive to keep lobbying for change. Regardless of your background, experience or attitude towards this subject, it influences your daily life, from the dangers that face our children to the fact that your favourite high street shop has to inflate its prices in order to recompensate for their daily shop lifting tally. Let's hope that the Home Office have a few copies put under their noses. This book should be a catalyst for change. In this fascinating book the drugs war is seen from the viewpoint of a former undercover cop. Allowing that every sentient being in the universe has its own agenda, mostly justifying itself to itself and third parties, the author achieves a good deal of distance to his subject, in a good sense of distance. An insight in a world that most of us, though far too many of us will never experience. An amazing book to read. A real insight to the history behind the war on drugs in the UK. Very powerful and a massive eye opener. Expect your beliefs to be challenged and blown apart! This will leave you asking why? Also make sure you read Good Cop, Bad War from the same authors. Oh and Drugs without the hot air for some real learning. 5.0 out of 5 starsTerrifying is correct, a fascinating and timely publication, everyone from those on each side of the argument to the undecided should read this (especially if you are certain in your opinions), it has relevance for us all. Well sourced and wide ranging, this book would be an excellent gift to a friend with strong opinions of someone looking to expand their knowledge. I raced through this genuine page turner of a book and learned an awful lot as I did so. Frightening without scare stories, this is well researched and a huge broadside at the uninformed who argue against the evidence provided by their own policies.